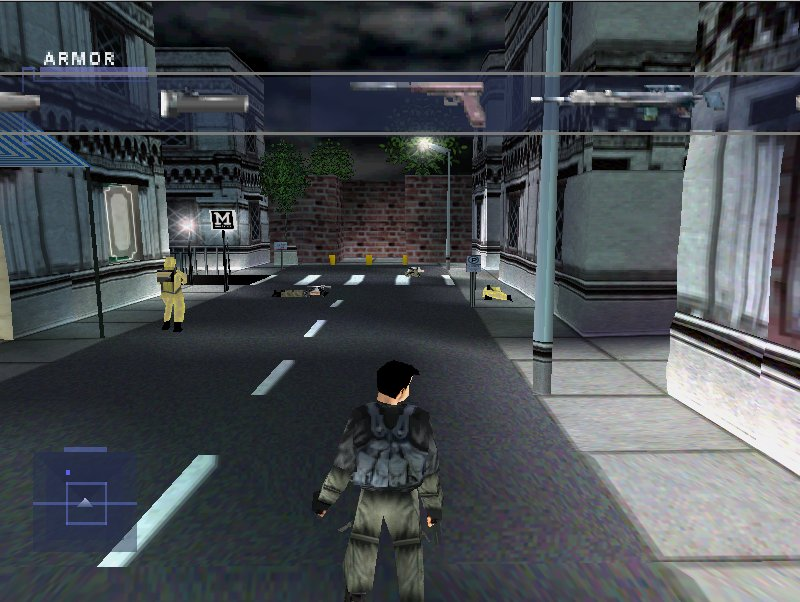 In 1999, Eidetic’s Syphon Filter was released hot on the heels of Konami’s Metal Gear Solid. While MGS went on to spawn a colossal franchise and basically become synonymous with stealth games, Syphon Filter lived somewhat in its shadow. It was well-received and sold nicely, leading to a number of sequels across the next 10 years, but didn’t become the pop-culture giant that MGS did. 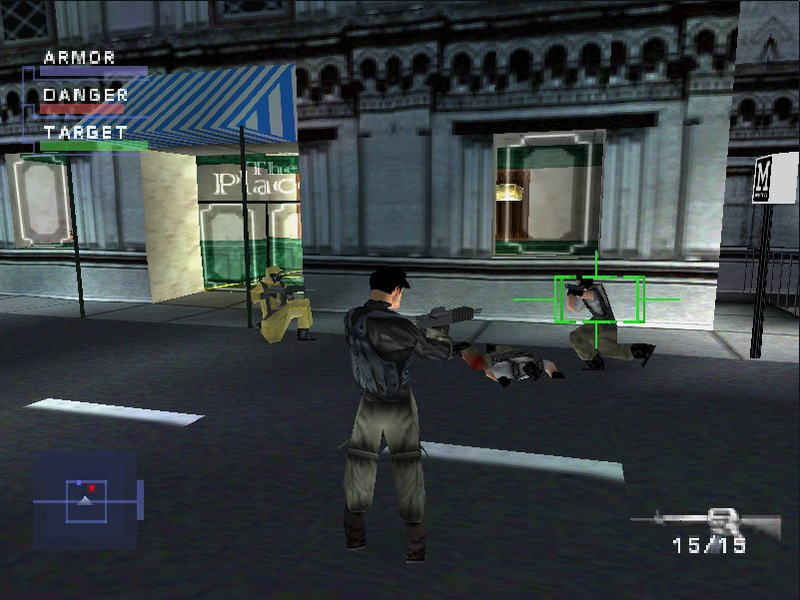 Still, the original Syphon Filter remains a PS1 classic, and it’s not at all like Metal Gear Solid; Eidetic actually took inspiration from the mighty GoldenEye, and hadn’t even heard of Hideo Kojima’s game when they started working on Syphon Filter. It’s more of a realistic spy-romp, without the larger-than-life characters and towering mechs found in Solid Snake’s world. 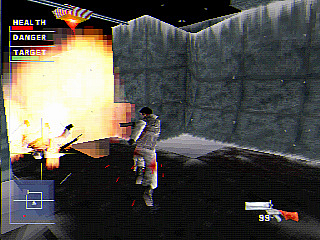 In Syphon Filter, leading man Gabe Logan carries a nice range of weapons, but the most memorable has to be the taser. This is an all-purpose tool, ideal for icing gun-toting grunts to save ammo, though you have to be within fairly close proximity for it work (otherwise the wire won’t reach). Using this never fails to be fun. While it could easily have been designed to kill enemies in a bland, simplistic way, the taser instead wastes bad guys in a hilariously OTT manner: if you hold the ‘fire’ button down long enough, the zapped enemy will burst into flames and cook on the spot. They flail, they scream … it’s gruesomely-awesome stuff. Perhaps most fun of all was toasting enemies perched high off the ground and then watching them fall several storeys as a fiery streak. 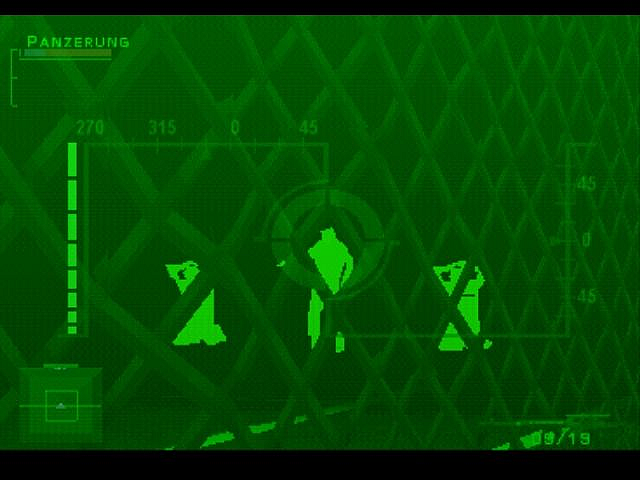 This is a real jewel in Syphon Filter’s crown. The night vision sniper rifle works beautifully, allowing you to waste enemies from afar in even the darkest, murkiest conditions – as seen in one stand-out moment during the Washington Park mission. Remember this? 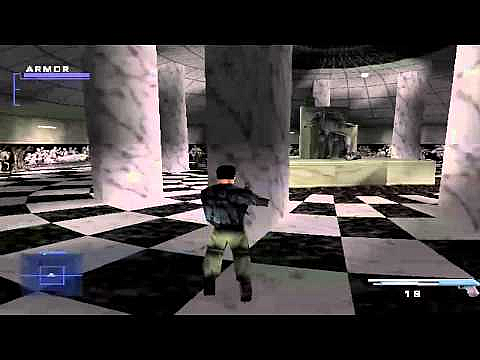 It’s easily one of Syphon Filter’s strongest stages, set in a lush park on a rainy evening; Gabe’s tasked with finding a number of bombs and covering specialists as they strive to disarm them whilst under fire. Later on in the mission, you have to rescue hostages from a guard on a tennis court: if the bad guy sees you approaching, he’ll execute the prisoners. So what do you do? 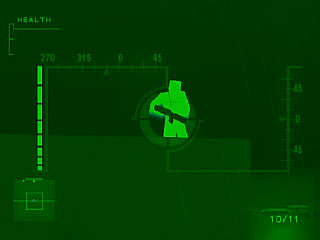 Why, just whip the night vision sniper rifle out, of course! Zero in on his glowing green silhouette and pop him in the head. Problem solved. It makes you feel like a genuine badass with cutting-edge gear, and makes the most of the atmospheric dusky setting. Syphon Filter blends stealth and action beautifully. As it’s mission-based, this lets the developers base some stages more around balls-to-the-wall combat and others around keeping a low profile. Still, in many levels it’s a mish-mash of both styles: you need to creep up on enemies, picking them off one a time, before facing a crowd of others head-on. One mission, the Stronghold Catacombs, is easily the most frustrating. You’re tasked with following a scientist through dark catacombs for what feels like hours … and he has a nasty habit of spotting you again and again. For this writer at least, that mission was rage-inducing back in the day! 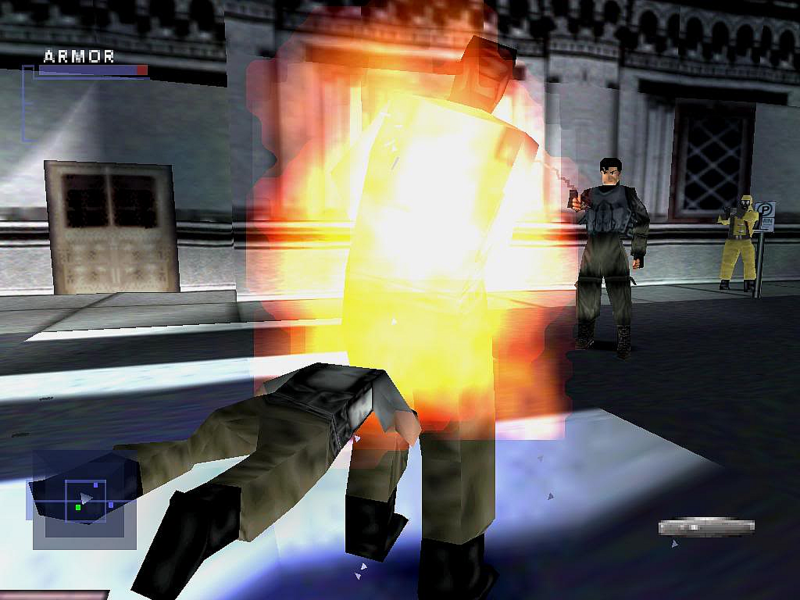 Syphon Filter makes busting a cap in enemies’ heads quick and easy. How? 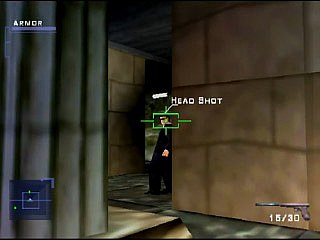 The helpful ‘Head Shot’ text that appears over bad guys when, in your first-person targeting mode, you move the crosshair over the right spot. A well-executed head shot’s essential for killing bad guys in a hurry, without raising the alarm, and for making the most of your ammo. It was a novel feature that still adds to the game’s unique look and feel today. As mentioned above, Gabe’s always packing some serious heat, boasting an arsenal of guns and explosives to make your average Arnie character green. You have handguns, shotguns, grenade launchers, machine guns, grenades, and more – it’s not realistic for Gabe to be carrying as many as he does, of course, but who cares? It keeps the action feeling big and exciting, and you’re free to choose the perfect weapon for your situation: sometimes, you want to go in all guns blazing; other times, you need to pick enemies off from a distance with your sniper rifle. 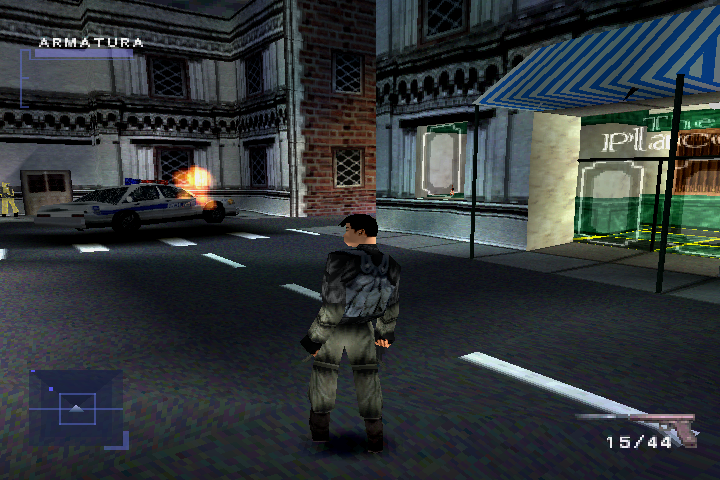 Syphon Filter does a brilliant job of capturing the visceral action and excitement of a Hollywood movie. When the game starts, you’re tossed onto Washington’s streets, shooting at scumbags and getting stuck right into urban warfare; it kicks things off with a bang, dropping you right into the battle. Another mission, the Main Subway Line, has you running through burning tunnels, while the Expo Center Dinorama is a real highlight; this is the stage where Gabe’s dressed in a tux, just like Bond, and ends up crashing through a glass ceiling in spectacular fashion. The latter stage is a nice set-up, letting you live the traditional spy-at-a-fancy-gathering trope we’ve all seen so many times for yourself. Syphon Filter has plenty of replay value. Not only are the weapons and the action-based moments a blast to go through again and again, but the game’s atmosphere can coax you back for multiple tries at a level. For example, the Washington Park mission is a beautifully-designed stage, with exciting moments aplenty. The Rhoemer’s Stronghold mission is another that lives up to numerous playthroughs, as it truly shows the game at its best. Syphon Filter has a big, exciting plot based around biological warfare. It might not have quite as many unforgettable figures as Metal Gear Solid, but it takes you around the world and makes the stakes feel sky-high. Rather than simply running around Washington trying to stop criminals or thieves, you’re trying to defuse bombs loaded with a virus that can be tweaked to target people of specific groups. It’s a pretty bold storyline for a game, and made enough of an impact to inspire multiple sequels. Gabe Logan’s a terrific hero for a game; though he’s a super-spy, he feels more human and three-dimensional than some action-game protagonists, especially given its era. His gravelly voice, athletic movements, and range of skills make him a joy to spend time with. Sure, he’s highly-decorated and something of a superman, but he’s not the foul-mouthed, ridiculously-buff macho type we’ve seen in certain action games in the past decade. 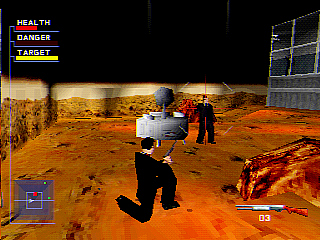 Chuck Doud’s soundtrack for Syphon Filter adds plenty to the game’s atmosphere. The mix of ambient sounds and adrenaline-pumping beats manage to establish a unique feel, and always complements the on-screen action brilliantly. Whether you’re creeping through dark hallways or blasting at scumbags, the score really immerses you in the experience, while adding to the whole blockbuster, Bond-esque charm. What are your favourite things about the PS1’s classic Syphon Filter? Let us know!